Big Sky Commerce offers superior solutions for businesses in the “card-present” environment. Services provided in the retail environment include credit card processing, debit card processing, check guarantee and conversion, Electronic Benefits Transfer, Gift Card and Loyalty cards, and processing for fleet cards including Comdata, Voyager and Wright Express. Big Sky Commerce provides the most versatile and cutting edge Point-of-Sale hardware available in the industry today including Verifone, Lipman Nurit, Hypercom, Ingenico and Talento. Our applications are compatible with most hardware, allowing for merchants to use our services with existing equipment. Big Sky Commerce can also integrate seamlessly with PC Point-of-Sale software such as Squirrel, Radiant, Aloha and Micros. We can work directly with your software vendor to make sure that the transition to our services is quick and straightforward. 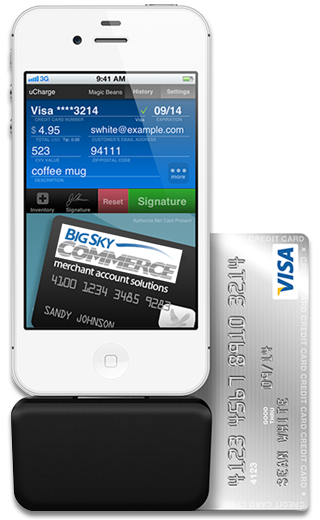 Big Sky Commerce offers superior solutions to mobile merchants. Contact Big Sky Commerce with any compatibility questions. We also carry handheld mobile processing terminals that use GPRS, CDMA and wireless internet services. This is a great option for a merchant who attends tradeshows or have a high volume of transactions to process in a short amount of time. They are fast, durable and easy to use in the ever changing technology of mobile processing. Big Sky Commerce offers an online payment gateway that can easily be integrated into your website for online ordering.